Weenthunga's network is lucky to include many wonderful individuals with fantastic visions and achievements. We would like to acknowledge and celebrate their successes. The fellowship assisted Steff implement a project: Young women follow their paths: health & welfare which will assist in building strong, healthy young First Australian women, whilst linking them in with First Australian health professionals – show casing great career opportunities. The project focuses on First Australian girls in Years 11 and 12, partnering with organizations and individuals who understand the “two-way” model of working with First Australians. Steff will draw on the relationships that she has with education and health professionals and various related organizations to progress this project in 2013. When presenting Steff Armstrong with her Rowan Nicks Russell Drysdale Fellowship for 2013, her Excellency Govenor Bashir commended Steff on her important work, using her Fellowship, to engage with senior secondary First Australian school girls and link them in with health role models and mentors. Rebecca Crawford was acknowledged as an Emerging Leader for 2015-2016 by the Fellowship for Indigenous Leadership. Rebecca was awarded the Fellowship to support her work contributing to the health of First Australians in Victoria through raising awareness to the importance of good oral health. The purpose of the Indigenous Allied Health Awards is to recognise the contribution of IAHA members to improving the health and wellbeing of Aboriginal and Torres Strait Islander peoples. Rani Lawler’s award acknowledged her commitment to supporting communities through her work as a young Podiatrist. Terori Hareko-Samios was acknowledged as an Emerging Leader for 2015-2016 by the Fellowship for Indigenous Leadership. The Fellowship for Indigenous Leadership fosters leadership, providing exceptonal people with the support they need to achieve their vision for their communites. Lin Oke received a Commitment to Indigenous Health Award at the Indigenous Allied Health Australia (IAHA) Conference 2015. This was awarded to an individual who has demonstrated commitment and contributon to improving the health and wellbeing of Aboriginal and Torres Strait Islander peoples through allied health. In July 2016, Weenthunga’s Health and Educaton Consultant Stephanie Armstrong won the Bendigo NAIDOC Aboriginal Recogniton Award and Skye Anderson, one of our Bendigo girls, won the Youth Award Stef was recognised for a range of valuable contributons to the Bendigo community. She has initated a number of projects relatng to connectng with and supportng First Australian senior secondary school girls, showcasing to them a range of health careers. She has spent a lot of tme building relatonships with key community members, families, local teachers and tertary educators, fostering networking and collaboraton in their work supportng the girls. 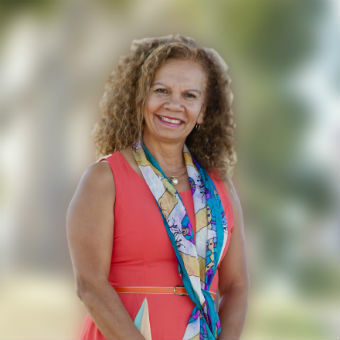 Stef is a very strong advocate for working two way - First Australians and Australians collaboratng and sharing, learning from each other and together being more efectve than on their own. Each year Aboriginal Victoria Department of Premier and Cabinet bring together local people who partcipate in their local network groups. The Local Aboriginal Networks (LAN) connect with many local groups to support development in 6 priority areas. At the state LAN (Local Aboriginal Networks) Forum held on the 22nd and 23rd November the “Weenthunga Girls Resilience Program” was recognised for their efforts to “support young people”. The award was a proud achievement to be recognised at a local and state level.